Chelsea manager Maurizio Sarri has admitted to Jorginho’s struggles for form and made it clear he wants the club to seal the transfer of a new midfielder. The Blues brought Jorginho to Stamford Bridge in the summer, raiding the Italy international from Napoli along with manager Sarri in what looked initially to be a hugely successful double swoop. However, Chelsea’s form has not been as convincing of late, and Jorginho may well be tired from having to play such an important role in this team so quickly. Speaking after CFC’s win over Newcastle this afternoon, Sarri made it clear he felt he could do with reinforcements in midfield due to not having anyone else to play the Jorginho role in his squad. The Italian tactician said it was not up to him, but seemed to strongly hint that Chelsea would need to spend to fix his side’s problems. ‘As you have seen Jorginho was in trouble, but I didn’t have a player for that position,’ Sarri is quoted by the Metro. 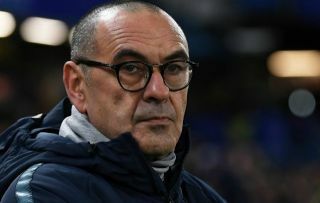 The Metro’s report adds that the players Sarri is keen on are Cagliari midfielder Nicolo Barella and Zenit Saint Petersburg ace Leandro Paredes.